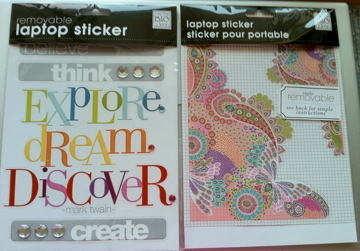 I found these at MICHAELS the other day and snatched up a few things. But first, here’s the scoop: Me and My Big Ideas now has removable stickers that you can put on your laptop, cellphone, even your walls. I’m not putting them on my computer yet … because I saw some on their website that I actually like better. I’m going to check my other Michaels and see if I can find them. If not, no big whoop … I’ll just use the ones I have. 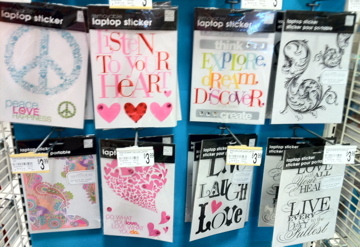 Have these made it to your Michaels yet? Do you like them? Get some? Oh, I miss scrapping. I should get back to it. I’ve never seen those before, and I do like them! 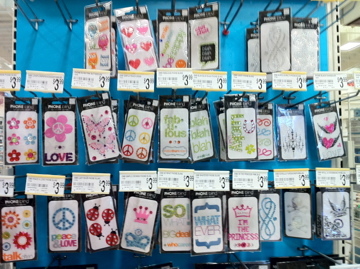 I’d use them on my cell, not my laptop though ‘cuz it’s works! 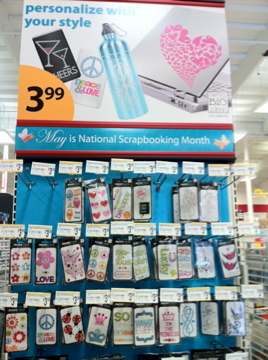 I enjoy that the sign on the endcap says “May is national scrapbooking month” …in mid-June…above non-scrapbooking items. That’s so Michaels isn’t it? 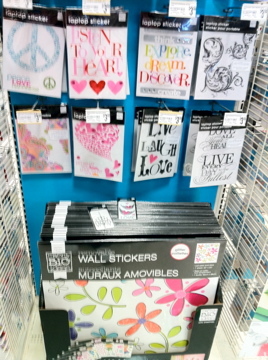 What is the brand of the big wall stickers at Michaels? I’m trying to track them down. They’re made by MAMBI, Me and My Big Ideas.